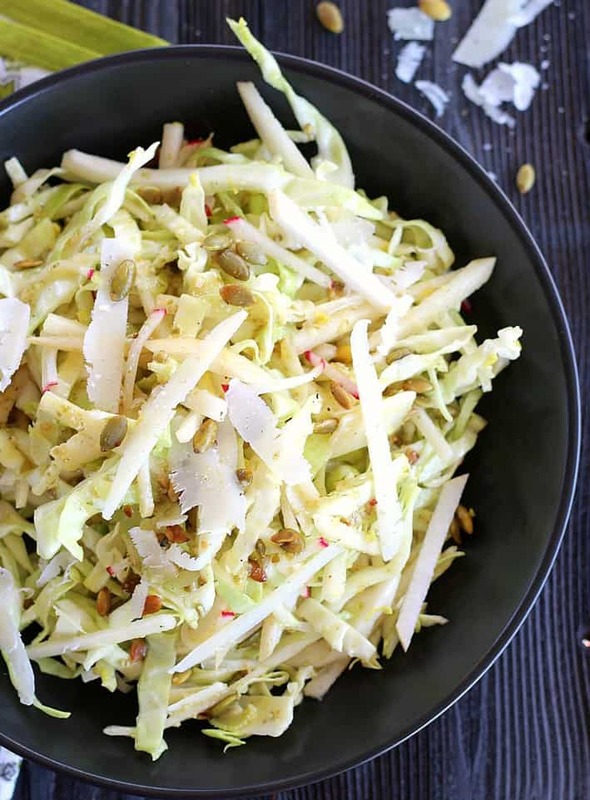 This Asian Pear Cole Slaw recipe is not your average cole slaw! Unique ingredients that are super good for you and tasty as well (most important, right?). First of all, raw cabbage is becoming the new trendy vegetable thanks to it’s benefits in the cruciferous veggie category and green cabbage is crunchy and mild. 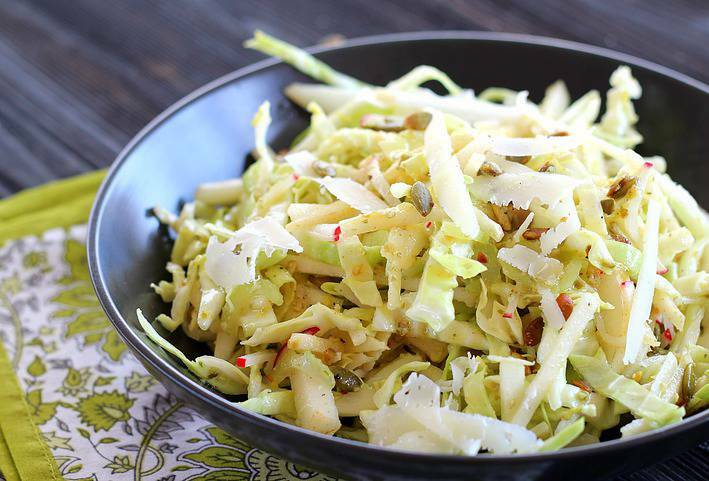 A fennel bulb gets thinly sliced into the cole slaw and adds a subtle licorice flavor. Did you know that fennel is a member of the carrot family and is a great source of fiber and vitamin C? See, more healthy stuff. Some don’t care for fennel’s taste, but I promise it’s super light and it works very well with the other players in this party. Crunchy celery and peppery radishes add to the complexity of this dish. The star of this cole slaw recipe is the sweet Asian pear (more fiber and vitamin C, plus potassium). If you can’t find Asian pears that are ripe enough when you want to make the salad, try some Granny Smith apples, or pears like Bosc or Anjou. Red Anjou would add pretty color ribbons to the cole slaw. The vinaigrette in the recipe is light and features Dijon mustard, extra virgin olive oil, maple syrup, fresh lemon, and roasted pumpkin seeds chopped up. Last but absolutely amazing in this recipe is the use of my favorite cheese, Manchego. If you haven’t tried this fruity and nutty Spanish cheese made from sheep’s milk, you’re in for a real treat and I highly recommend you search it out. It provides a nice, creamy texture that works perfectly with all this crunchiness. If you want, substitute a nice Gouda or white cheddar… but please go for the Manchego. Bonus, the Cole Slaw can be made partially in advance. You can roast the pumpkin seeds, and slice the cabbage, fennel and celery up to a day ahead of serving. The pepitas are featured in my Turmeric Roasted Pumpkin Seeds recipe and will actually be so addicting, I recommend roasting up to two cups early in your week so you have them on hand for this recipe and for snacking or adding to any salad or vegetable dish. 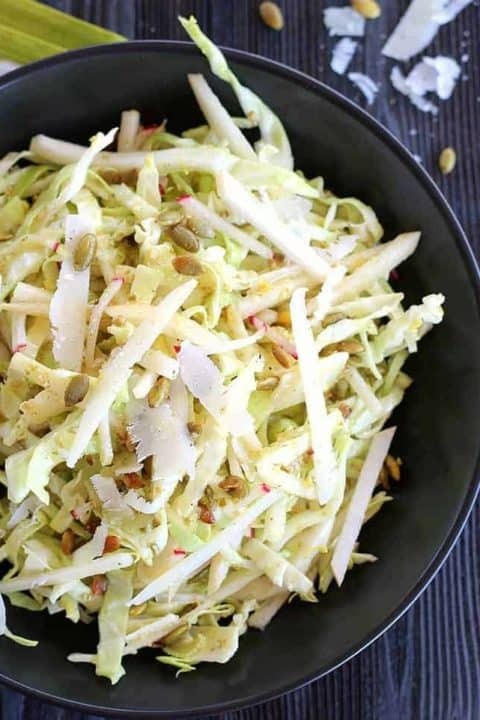 Asian Pear Cole Slaw pretty much goes with anything that you want to cook on the grill or just by itself for a complex flavored lunch salad. Top with some wild smoked salmon or freshly cooked chicken and you have a main dish dinner salad. Or go really crazy and toss in some cooked whole wheat spaghetti and toasted cashews. Double the dressing for this option. Enjoy! The cole slaw can be partially made in advance; toast the pumpkin seeds, shred the cabbage, radishes and celery up to a day before. The asian pear and manchego do better when sliced the day of serving. The dressing can also be made the previous day. Preheat oven to 350F degrees. Drizzle 1 teaspoon EVOO on pumpkin seeds, season with 1/4 to 1/2 teaspoon each of sea salt, black pepper, and turmeric. Add 2 drops sriracha. Mix well, spread pumpkin seeds on a baking sheet and bake for 5 minutes until seeds start to darken and plump up. Remove from oven and let cool. Note; of course you may add whatever seasonings you like to the pumpkin seeds before toasting, but the spices above are a great, healthy combination. Finally chop 3 tablespoons of the pumpkin seeds. Whisk the pumpkin seeds with the 1/4 cup EVOO, lemon juice, Dijon mustard, maple syrup, salt and pepper. Taste and add more salt and pepper to your liking. Set dressing aside. 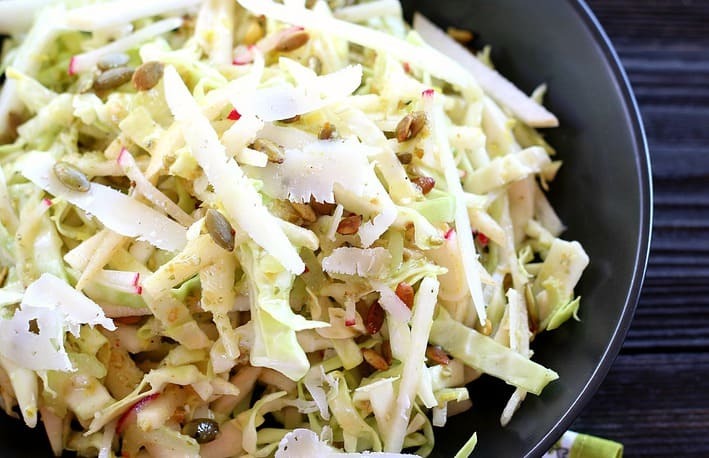 Combine cabbage, fennel, Asian pear, radish, celery and 1/4 cup of the Manchego in a large bowl. Add remaining pumpkin seeds and toss to mix. Drizzle dressing over top and toss again. Taste and add more seasoning or cheese as desired. Serve in bowls topped with remaining Manchego. Inspired by a recipe in Bon Appétit magazine.